It was made from a fresco, which is a type of weave. The cloth is very old-fashioned and had pretty much disappeared until around six years or so. It came right back into vogue and the great thing about the cloth is it is so crease-resistant. It’s such a tight, springy weave and just bounces so that no creases can get into it. It’s a low-buttoning double-breasted jacket. You can see from the picture that it has only two buttons on the front. Those buttons aren’t that far apart, so there is a mean, minimal kind of look. 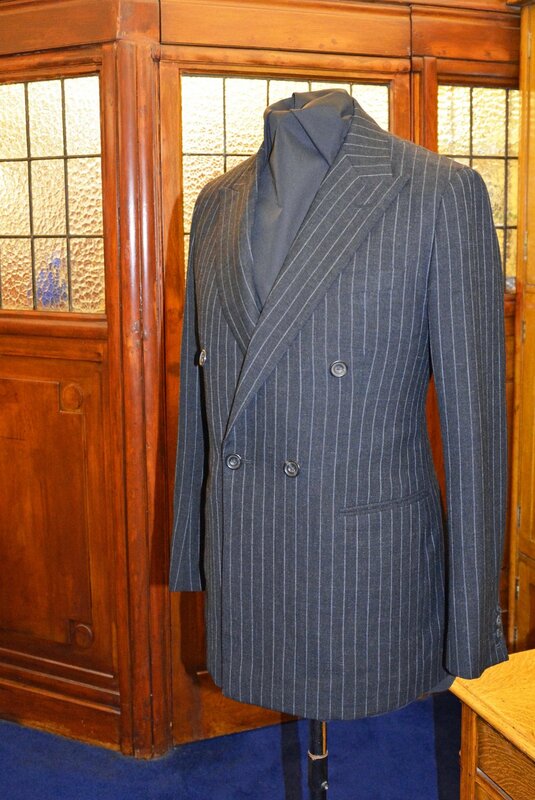 There are no flaps on the pockets, it is a modern length and the peak lapel is relatively wide and high to the shoulder. The jacket has got a flat sleeve-head and a really high-cut armhole. The result is obviously a softer shoulder and it just works.